The Xperia Z is one of the main pillars of Sony's new plan to focus on mobile, gaming and imaging. In fact, it's a device that addresses all three of those areas, while also pressing reset on Sony's smartphone past. The handset ushers in a new design language, one Sony's decided to bring to its new tablet too. It's called omnibalance design, but it's best described as a combination of 90-degree angles, even weight distribution and flat glossy sides. Once you get to look at the phone in person, all Xperias that came before it pale in comparison. The phone feels solid and you'd be hard-pressed to describe any part of it as plasticky. Between those mirrored sides, you'll find Sony's first 1080p phone display, measuring five inches and benefiting from the company's new Bravia Mobile Engine 2. Improvements to the Xperia line aren't merely cosmetic, though: Sony's added a 13-megapixel camera (featuring the HDR video-capable Exmor RS sensor) and a 1.5GHz quad-core Snapdragon S4 Pro -- Qualcomm's most potent mobile processor currently available. Meanwhile, those precious electronics are protected by a shell that's water- (IPX5/7) and dust-resistant (IP5X). It's rare to see such protection on a phone that's not being marketed as a rugged device, let alone a company's new flagship. Sony is looking to succeed in mobile and, with just a week away from the world's premier phone tradeshow, has the company created something that can stand up against current Android champions and win? 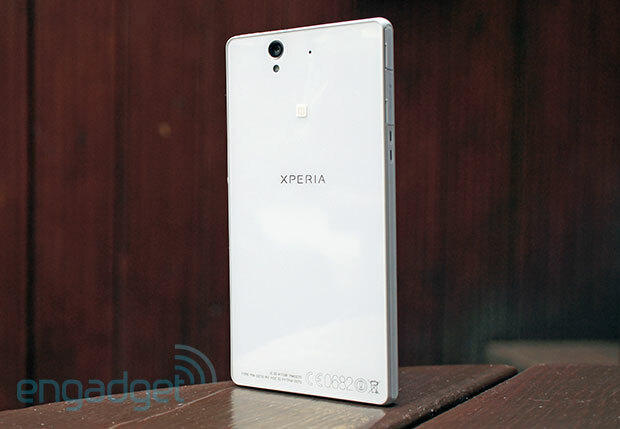 How would you rate the Xperia Z? Where to start with the hardware? How about here: this is Sony's best-looking smartphone ever. Lacking any removable panel to access the battery meant that the Xperia Z's components could be squeezed together into a slender profile measuring a mere 7.9mm (0.31 inch) and weighing in at 146g (5.15 ounces). Thanks in part to the hidden ports, light is able to bounce off the phone's white sides. In short, it's a real beauty. It's worth noting that alongside the increasingly safe choice of black and white, there's also a purple edition -- one that our Spanish team got to play with. Where to start with the hardware? How about here: this is Sony's best-looking smartphone ever. But while it's certainly a looker, the expanse of that 5-inch screen and accompanying bezel mean that it isn't the most comfortable smartphone we've handled. Compared with the substantial Lumia 920, the Xperia Z is slightly taller, but it's easier to grip, thanks to that slimmer shape. Put differently, it feels more like the Droid DNA than, say, the Galaxy Note II. As we noted before, reaching the phone's upper edge is a bit of a stretch if you're using it one-handed -- we're hoping Sony's incoming Xperia ZL (with its smaller dimensions) will prove a little more manageable. Thanks to one very geometric silhouette, the phone is a little uncomfortable to hold after extended use, what with those sharp corners pressing into your palms. However, we had no problems sliding it into our pockets -- something we can't say of other phones with 5-inch screens. That glass-coated backing brings the Xperia Z into such esteemed company as the Nexus 4 and iPhone 4S, although Sony has differentiated its design by extending these glass panels to the sides too. Both the back and front include a shatter-resistant layer (not Gorilla Glass), while a glass-fiber polyamide skeleton connects all those panels together. This skeleton rounds out the corners between the panels, which helps smooth those angles at least to some extent. Two other notable features are the Xperia Z's IPX5/7 and IP5X ratings. In real terms, Sony says the phone can handle water up to a depth of one meter, and is resistant to guided water jets. It's also designed to steer away dust from the phone's more delicate parts. To access the micro-SIM and microSD slots, as well as the micro-USB and headphone sockets, you'll need to flip out the sealed covers. There's a rubber lining behind each one, ensuring the water's kept out. We tested it in bowls of water, the shower and even gave it a quick hose down, but none of this resulted in a panicked call to Sony requesting another review unit. The flaps also feel substantial -- we have no concerns about them breaking off after extended use. Heck, you could even lift the phone up with them (not that we suggest you do that). At the same time, opening these flaps is less laborious than pulling off a battery cover or battery to access a micro-SIM slot or SD reader. While you won't have to open those flaps very often, you'll be accessing that micro-USB port pretty frequently. (Not to spoil our battery performance section, but the runtime isn't great.) With all those mechanical openings covered, it would have been nice to see some form of wireless charging, given that it's already out there on rival phones like the Lumia 920, Droid DNA and Nexus 4. Thanks to those port covers, however, the phone's streamlined perimeter is interrupted only by the power button, which will look familiar to anyone that's turned on a PlayStation Vita. Just off-center along the length of the right edge, it's made of machined aluminum (like the volume rocker just below it) although you won't get a camera button this time around. This is apparently a sacrifice that had to be made to ensure the phone would be water-resistant, but it feels like a glaring omission just the same. 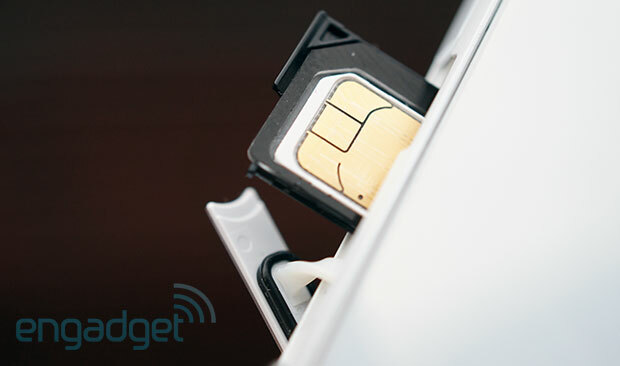 The micro-SIM slot is on the same side, while a single loudspeaker sits on the bottom of the right side. Unfortunately, the speaker is tinny and, even on full blast, lacks punch during video playback. On the left edge, you'll find the covers for microSD and micro-USB, plus contacts for an as-yet-unseen dock. Flip the phone over to the glossy (but fingerprint-prone) back, and you'll note the main 13-megapixel camera, flash and secondary mic. The lens is fortunately slightly recessed, which should defend it from scratches. When we pulled the phone out of its packaging, there was a removable NFC sticker, but otherwise there are only some Xperia branding and a few serial numbers at the bottom interrupting that white surface. On the front, there's no white paneling (aside from a sliver of the side), with a black border instead framing the 5-inch screen. Up top, you'll find the front-facing 2-megapixel camera with Sony's Exmor R sensor -- and it also supports HDR! Below the screen, there's nothing beyond the phone's mic. The Xperia Z has on-screen buttons rather than any capacitive keys. While quite a few companies have announced phones with 5-inch, 1080p displays, the Xperia Z is still one of the first to arrive for review, if not the first. The phone beams out a resolution substantially higher than the Xperia T, and as dimensions have increased only slightly (4.6 to five inches), it offers a higher screen density of 443 pixels per inch. As we said during our Droid DNA review, while there's less of a leap from 720p to 1080p compared to qHD to 720p, that's not to say you won't notice sharper fonts, richer images and a crisper view of your photos. Comparing the Xperia Z against the only other 1080p phone we've reviewed, the Droid DNA, Sony unfortunately comes in second place. Sony is calling its new, thinner display the OptiContrast panel, but its performance doesn't offer the same viewing angles, or outdoor performance, of HTC's Super LCD 3 screen. In fact, turn the screen away from straight-on viewing, and you'll see a grayish discoloring that starts to obscure what's going on -- especially under bright light. While Sony says the new display construction should reduce reflection, sunshine and certain lighting conditions often made it difficult for us to read even the home screen. As we've also seen on Sony's mobile displays in the past, black backgrounds and detail often appeared more like a dark gray. If anything, the phone is often too bright -- the Xperia Z's brightness setting could do with a wider range of contrasts and a lower base setting. Not that we'd want to lose the brightest option, as while you won't have anything to fear from rain with the water-resistant Z model, we needed one of the top brightness settings to see what we were doing on the touchscreen when the sun came out. This is the first phone to feature Sony's improved Mobile Bravia Engine 2, which is responsible for a host of contrast and sharpness enhancements to your photos and videos (whether they were recorded on the phone or downloaded from some other source). The software will tweak darker regions to be even blacker, while distortion from lower-quality videos from the likes of YouTube is also reduced -- videos did look marginally smoother. Conversely, there's also a sharpness filter for images, which boosts edges and contrast -- apparently without adding noise, either. The additions seem a bit more aggressive than on preceding Sony phones, and when we looked at our freshly captured photos we noticed an excessive bluish tinge on some of them, regardless of white balance selections. This doesn't appear to be tied to the Bravia tweaks (which can be turned off if you don't like your photos extra-saturated) and appeared substantially reduced when we viewed them on other device, like a PC. It's the debut for Sony's new Exmor RS sensor. Promising improved signal processing, while matching the image size of the Xperia T (up to 12 megapixels); it's a whole new sensor. The standout improvement here is HDR video, offering a bigger dynamic range of lighting in your video capture. In practice, it works well. 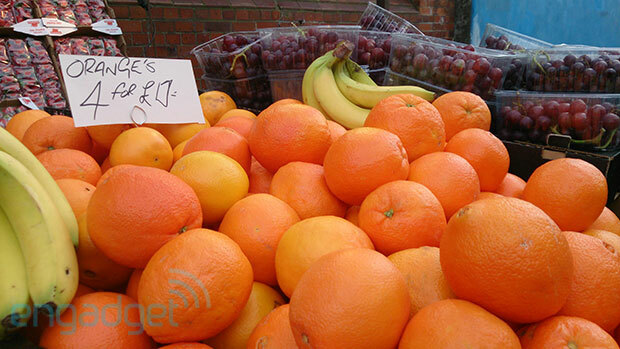 We test a lot of cameras, and the Xperia Z's new feature generally offered better light composition during our tests. Sometimes it overcooks colors, with a bit too much noise, but we'll definitely take that in exchange for the better light balance. Check out our sample video, taken in a dimly light underground tunnel. Naturally, HDR stills are also possible, although during our time with the camera we found the new "auto i+" setting generally offered up results that were as good (if not better) than what we got with the HDR option or manual settings tweaks. The new auto setting mostly does an excellent job adjusting ISO, white balance and toggling HDR. After we were done taking our comparison shots, we ended up leaving the phone on auto for the majority of our photos. Most of our shots were taken on the preset 9-megapixel setting and though the phone does output images at 12 megapixels, they arrive in an awkward 4:3 ratio that doesn't really do the high-resolution screen justice. However, when comparing both sizes to 8-megapixel images on rivals, we found those larger images offer scope for a little more detail. The 9MP images appeared almost identical in quality to the full 12MP samples, although the subject appears closer. Color reproduction was good, with HDR offering a boost to our low-light images. We did notice that HDR mode on stills was pretty gentle -- probably due to that Exmor RS sensor tweaking we heard about late last year. Compared to our photos on normal mode, there's some slight highlighting of darker areas. So it's bad news if you were hoping for the same sci-fi-esque effects you get on other HDR cameras, but it's at least more realistic. Sony has also made adjustments to the camera interface, which at least started in a good place, with access to ISO and white balance, not to mention the ability to create shortcuts for these right on the surface camera UI. There's now a burst mode, capable of 10 frames-per-second at 9-megapixel resolution. You can now grab shots while taking video, but better still, there's no need to flip between camera and video camera modes -- just choose the appropriate record button. Also, if you've used one of Sony's point-and-shoots (or even NEX cameras) you'll find navigation and icons have been transported across. Like the button detail from the Vita, it's great to see Sony's many electronics lines finally start to converge towards each other. The Xperia Z arrives just behind the latest Android iteration. 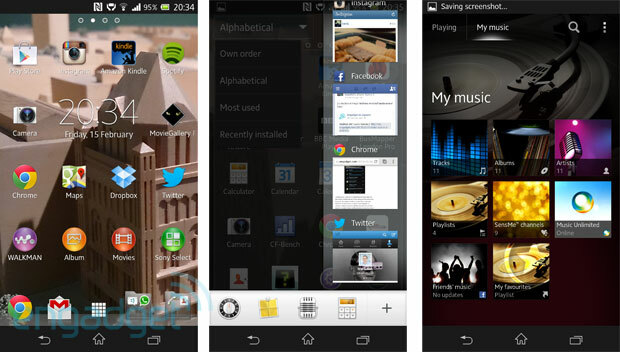 It's still Android Jelly Bean, but it's version 4.1.2. Admittedly, the additions since then are relatively minor, but Sony has the unfortunate knack for launching its best phones without the very brightest software. Since last year's Xperia models, we can now welcome Google Now to the fold, while Spotify and other apps are now accessible from the lock screen. Take a closer look at Sony's distinct take on Android and you'll find some likable additions, like the Rolodex-style gallery widget or the expandable power management widget pre-installed alongside some slightly more unnecessary space hogs, like a Walkman audio player widget or Sony's Entertainment Network. Yep, you'll be hard-pressed to avoid Sony's media libraries when you first boot up the phone. We resisted the urge to delete these from the outset and gave them a try, regardless. Sony Select offers a gentle introduction to Google Play wares, as well as Xperia-centric music and movies. We can't fault it for offering a spot-on selection of beginner apps, but you'll find there's a lot of crossover from Google's own recommended section. The gaming options here are a little more tiresome, although you'll get some of Gameloft's better (and licensed) titles here. Again, we're not sure if anyone already versed in buying their apps and games direct from Google will need the Select service -- the icons even redirect to Google Play. Sony's thrown your video collection into its new movies icon. It's also a more subtle way to usher you towards its Video Unlimited catalogue of movies and TV shows. We tried the service out, downloading a 90-minute (1GB) movie quickly enough. Prices are a little steep: we bought Mass Effect for £11.99 (it's just £8 on the UK's Google Play), while renting costs £3.49 -- the same as on Android's stock movie service. The payment process is all relatively painless once you've got your Sony Entertainment Network account up and running -- you can even use the same username from your PlayStation. Still, it's a shame to see so relatively little 1080p content, something to showcase that full-HD display. Almost everything we browsed (even Sony movies like The Amazing Spiderman) had a standard-definition option and nothing else. The player itself was at least capable; it plays back DivX videos and uses Gracenote to grab extra details, like cast lists. Walkman, its musical counterpart, contains your own music catalog, a few free tracks from artists like Tom Odell and -- no surprises here -- Music Unlimited. Signing up for a premium subscription will net you offline playback across your compatible Sony hardware, the iPhone and other Android devices. In the UK, this rings up at £10 and there's a good amount of music on offer -- thanks to Sony's own music industry clout. The service has also recently upgraded its streaming quality to 320Kbps on Android, PS3 and PCs. But if you've already got a Spotify subscription going, we can't find much here to pull you away. There are also a few extra apps that also land on the phone right out of the box -- some good, some less so. They include Dropbox, File Commander, Sony's WiFi-connected Media Remote for compatible TVs, OfficeSuite, Sony car (think big icons for use on the move) and Socialife. That last one is Sony's latest effort to combine your favorite RSS feeds with Twitter and Facebook updates. It's less intrusive (and resource-hungry) than the widget we remember from previous Xperia phones, but there's nothing that compelled us to use it beyond some cursory testing. For now, we'll stick to Flipboard and Pulse. A more notable addition is Sony's new Stamina battery saver mode. Located under power management in settings, the focus here is to stop rogue apps from accessing data through your phone signal (or WiFi) when the screen is turned off. We're sure you're thinking, "Makes sense, but what about your email?" Not to worry, as your mail and the likes of Whatsapp, Twitter and Facebook can all be added to a whitelist, so that they can ping for updates whenever they please. The power management section also gives you a rosy estimate of how many hours left on standby you're likely to get. Flip the stamina mode off, and you'll see that slashed, sometimes halved. It took us a while to figure out how to give apps permission to access data (hint: you need to tap on the Stamina mode bar) but once you have, adding apps that just need data is no hassle. However, perhaps due to the fact that we need to prod and poke the device during the review process, we didn't find any miraculous expansion of battery life through the new stamina mode. The screen was on a lot, meaning not only did the battery have to power that rich 5-inch display, but all apps were free to dip into data as needed. If you're a more casual phone user, the service could add a few extra hours of use, but we'd treat the phone's estimates of standby time with a pinch of salt. We already touched on the improvements made to the Xperia Z's camera app, but highlights include HDR video capture, seamless camera and video modes, burst capture and an enhanced auto mode that made taking decent stills much easier. For this editor, Sony has a more usable interface than that found on the stock Android camera, which can sometimes feel a little too stripped down. Qualcomm's quad-core 1.5GHz Snapdragon S4 Pro powers the lush 1080p screen, and is paired with 2GB of RAM, 16GB of flash memory and expansion through microSD up to 32GB. Does it sound a bit familiar? It should, as this is nearly identical to the HTC Droid DNA and (barring that microSD option and resolution boost) LG's Optimus G and Nexus 4, which at least makes for some interesting comparisons. However, numbers are just numbers and we found the Xperia Z to be impressively swift in most use cases. If anything, it handled processor-intensive tasks better than simple ones. We had a few issues with the phone stuttering while trying to open the task manager widget -- there's a substantial lag between your tap and the widget expanding to offer access to various wireless and brightness toggles. Similarly, when launching the camera app from a freshly booted device, it took a mind-numbing three seconds on average -- something that could be a dealbreaker for shutterbugs, especially considering the lack of a physical camera key. At least once it's running, it then launches within a more bearable timeframe. Alas, even then, launching the camera from the lock-screen still took around two seconds -- not good enough. What concerned us more, though, was that the Xperia Z didn't go beyond six hours on our battery rundown test. Looping video at 50 percent brightness, with WiFi on (but not connected), the phone managed a little over five and a half hours on our first test. That's actually longer than the Nexus 4 which also had issues going the distance at 5:18, but less than both the Droid DNA and the 720p Optimus G. Oddly, the Z model packs a 2,330mAh power cell, versus the 2,020mAh battery found on HTC's 5-incher. So what's going on here? We repeated our test twice, as it'd be a shame for an erroneous benchmark to sully the Xperia Z's name. However, the second round added only 10 minutes. It could be that Sony's screen tech is less power-efficient than HTC's IPS Super LCD 3. That's our best guess, as there's really not much else to separate the pair -- we even ran the video clip from the flash storage, not the microSD slot. Update: We've just re-run our battery test with the Bravia Mobile Engine 2 switched off -- just in case it was running behind our third-party app. (We've been told that the Mobile Engine is attuned to the album app's video player, YouTube and the gallery viewer.) Sadly, the results are about the same, with the Xperia Z lasting 5:10. Our UK-bound review model arrived with plenty of radio bands to share. There's quad-band GSM/EDGE (850/900/1800/1900) plus tri-band HSPA (850/900/2100) and a healthy dose of LTE on Bands 1, 3, 5, 7, 8 and 20. Unfortunately, we were unable to test the phone with an EE SIM, but across Three, EE and O2's HSPA services, we saw download speeds on HSPA+ around 4 Mbps, while uploads hovered around 1.5 Mbps. AT&T customers, with their compatible HSPA bands, are the ones most likely to benefit from importing the device early -- we've still heard no word about US pricing and availability for either the Xperia Z or the Xperia ZL. It's been five months since Sony's last phone, Xperia T, was released. During that review, we noted that while Sony had perfected the art of the press shot, the hardware really didn't live up to the fantasy. Particularly in comparison to an iPhone, Lumia or HTC's One series, it did the Sony brand a disservice. So, it's a relief to see the company now making a concerted effort to make a premium phone -- and that's what this is. If you weren't sold on the older polycarbonate look, perhaps Sony's new beauty will be more to your tastes. Exactly how much rough and tumble the Xperia Z's glossy sides will stomach remains a mystery, but after our testing period the phone is still free of scratches. We also applaud Sony for bringing water resistance to its new phone. Protection from an early watery grave often meant settling for less when it came to design or performance, but that's certainly not the case with the Xperia Z. We can expect to see many, many more 1080p phones through 2013, and while the Xperia Z might not best the overall quality of HTC's 5-inch panel, the phone itself has a far more distinctive look than its competitors. While the Snapdragon S4 Pro was the best of the 2012 processor bunch, we already know what to expect from phones later this year -- maybe Sony should have waited a little longer? Perhaps the bigger question is how to square the £300 difference (off-contract) between the Xperia Z and the Nexus 4. Both are powered by the same high-performance S4 Pro, with 2GB of RAM, but Sony's option has expandable storage, a 13-megapixel camera capable of HDR video and that 1080p display -- even if the Google phone's screen performs better outside of a pure pixel count. If the Xperia Z had trounced the Nexus in battery life, we'd have happily recommended the omnibalance smartphone, but a disappointing showing there makes it a much tougher call, and one your wallet might have to make for you.